Is something my husband has done for as long as he can remember. Me, on the other hand, I have been doing it for much less time. When you think of all that goes into taking care of just one simple dog can you imagine multiplying that by a thousand. And taking care of any animal requires many things- food, shelter, vet visits, attention. As livestock farmers we make decisions every day for the better of our animals. We keep record of sickness and adjust their feeding rations as they get bigger- a lot like a raising a puppy. There are many types of different pets you can raise- dogs, cats, birds. As farmers we can choose our livestock too- pigs, cattle, sheep. And we get to choose where our animals live. Inside or outside. 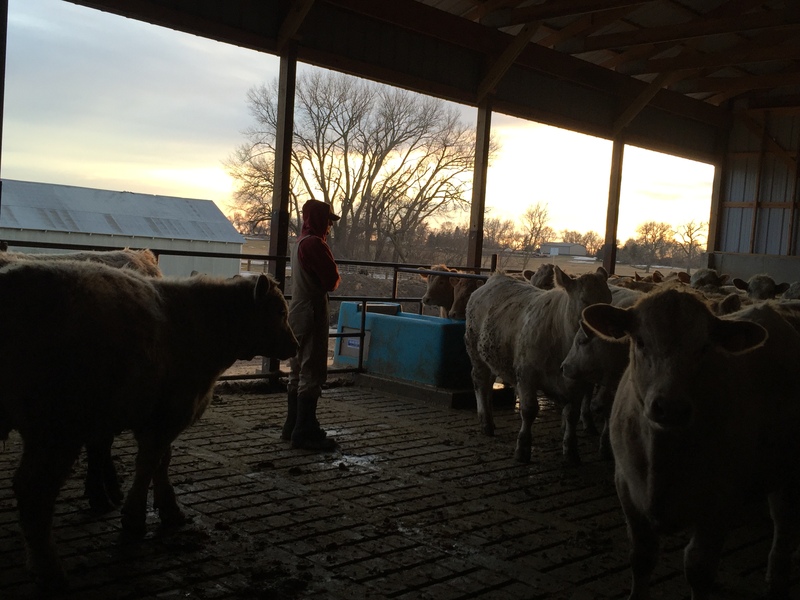 My husband and his family have always raised beef cattle outdoors in open feed lots. We had room at our place for one feed yard that had roughly around 100 head of cattle in it. But, we knew we wanted to take advantage of the permit we had in place for our property, and we also have a creek that runs through our pasture. So, expanding with an open lot wasn’t going to be an option because we wanted to be able to contain the manure from the cattle. I started doing research on the different options we had and I even attended a seminar that addressed various types of feeding facilities for cattle. I was immediately drawn to having a pit beneath where the cattle would be housed. I loved the fact that it was a giant holding facility for the manure and we could pump the pit when it worked best for our fields. And containing any runoff from the feed yard was really important for me. 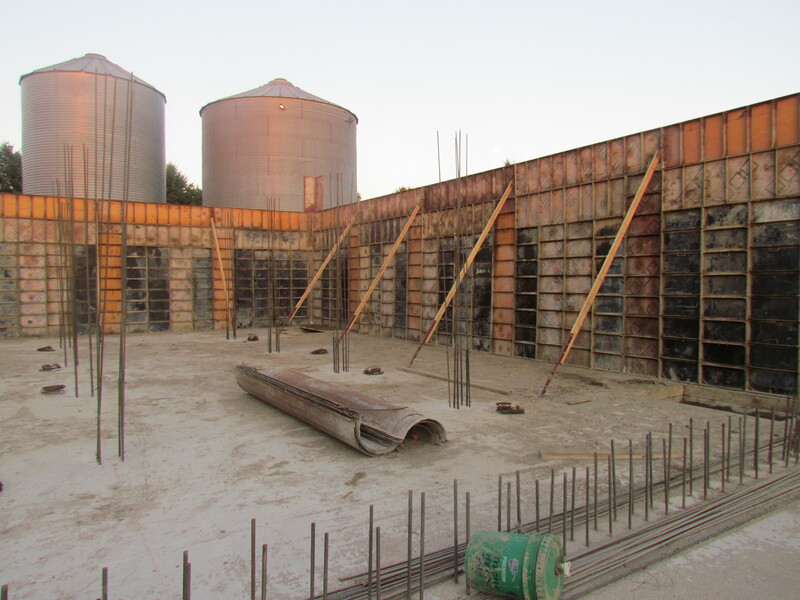 Because we loved the idea of a pit under the cattle it led us into wanting to put up a building. There are many pros and cons to what kind of building you choose. But, more importantly I think the decision of why we built the building, instead of replacing our open feed yard, is more important. What I love about the building is that the cattle are kept out of the elements. For example, it has been raining like crazy the last week or so here in South Dakota. A lot of rain means a lot of mud. Which mean any animal outside is pretty much covered in it. Our cattle in the building are pretty clean. And aren’t knee deep in mud. Even if they did manage to get a little wet in the rain storms we have a nice breeze that can flow easily through the barn, especially when we have the curtains on the north side open. It’s actually a very comfortable, breezy building to be in. I also really love how we were able to increase our herd size without having to worry about runoff into our creek. Another plus is the temperament of the cattle. 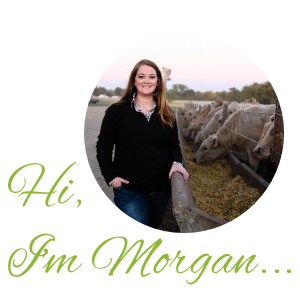 Of course we have a few that are pretty ornery, but my husband or I walk through the pens every day and with walking through the building the cattle get to know us and we also get an up close look at every animal. 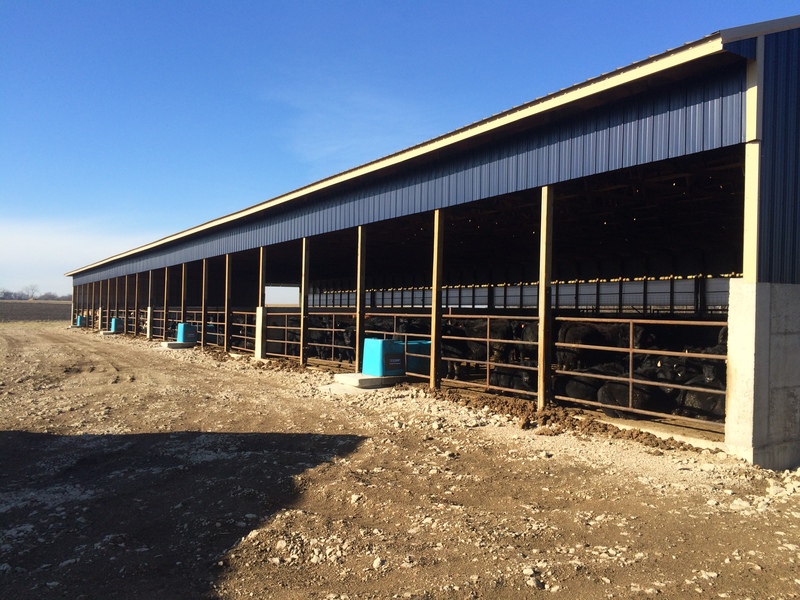 We do check the cattle in out open lots as well, but with the cattle being closer together and contained it makes things easier than having to worry about them running off on you when you get into the feed lot. We also have a really slick system set up for sorting. We have multiple gates through the walk way that allow for us to bring out an entire pen and then easily sort off which cattle we need and which cattle we don’t. I am sure if I asked my husband he could give you some things about the building he doesn’t like. Or things we wish we had changed. One thing that does stick out in we wish now we would have put a bigger concrete pad under the water fountains. The reason why? Because the cattle can easily get their rumps pressed up against it which means in the first few weeks we cleaned out the fountains nearly everyday while they were getting used to it. One thing I mentioned, but he seemed indifferent on was I wish we had put a water hydrant on the other side of the building or at least access to water for the cattle. But, it’s harder for me to haul pails of water to the sick cattle than it is for him. I swear it’s because I am so short. We have a group of pens to the north of the building that when we are treating cattle that are sick we have them separated off from the healthy ones, which means they need food and water hauled to them every day. 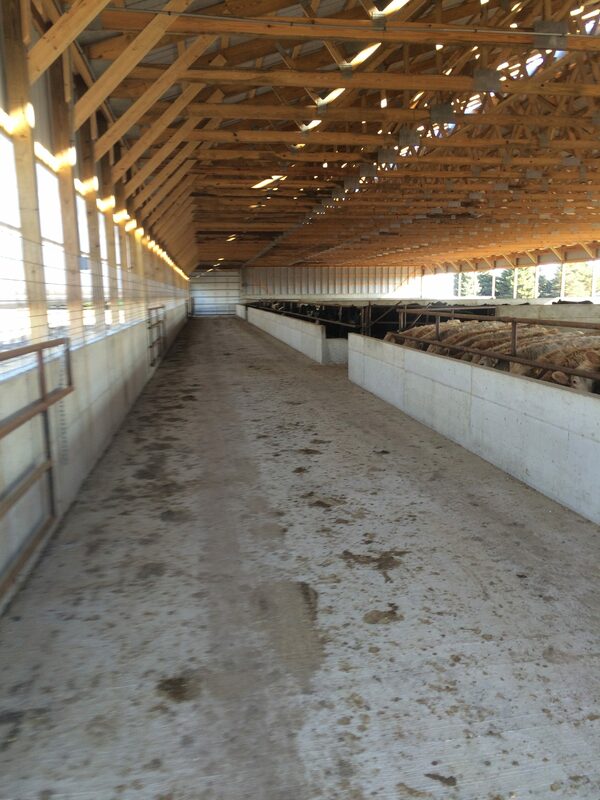 I am definitely in favor of feeding cattle in a building, but I also agree with open feed yards too. 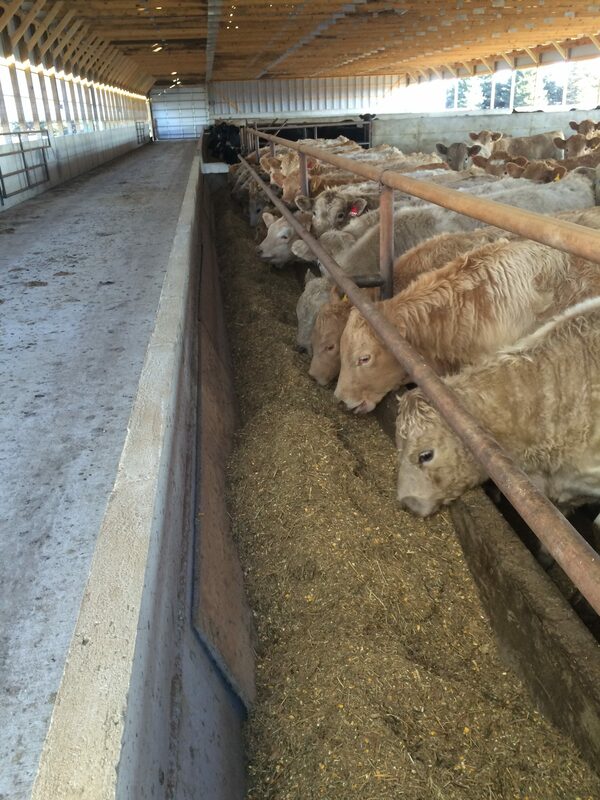 I think it all depends on the location where the feed yard and also what works best for each individual. So far, we are pretty happy with the choice we made, maybe I will do an update in three or four years!